One of the things I loved most about running a web design company geared towards food was the talent we met. So many of our clients have done big things in the food space and quite a few have become successful published authors. One of those ladies, Maureen, happened to write a beautiful cookbook based around her collection of Lebanese recipes. 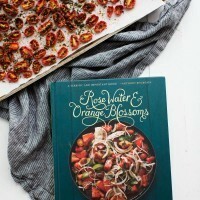 Her book, Rose Water & Orange Blossoms, has become one of my favorite, inspiring cookbooks. I’m sharing one of the more basic recipes from the book, but it’s one I think you should make before the summer tomatoes end. 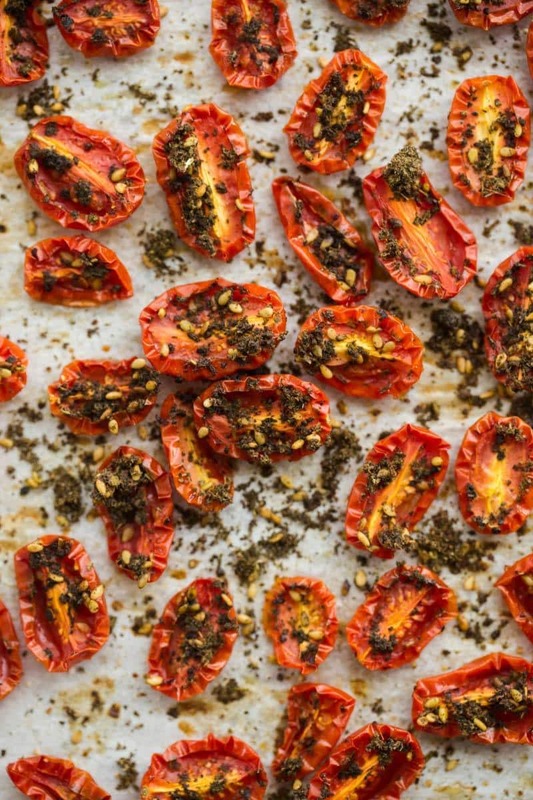 These roasted tomatoes are flavorful and can be used in a myriad of ways. 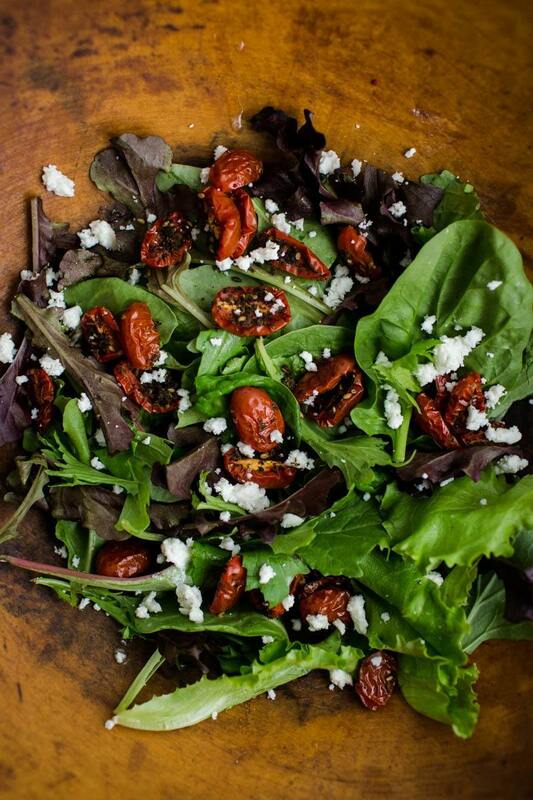 Maureen’s book includes a salad and a crostini recipe that uses these roasted tomatoes. I ate them right off the sheet tray and also with fried eggs, in a simple salad, and on hummus (all three photos below). I’ll be making a couple more batches of these before my tomatoes run out. 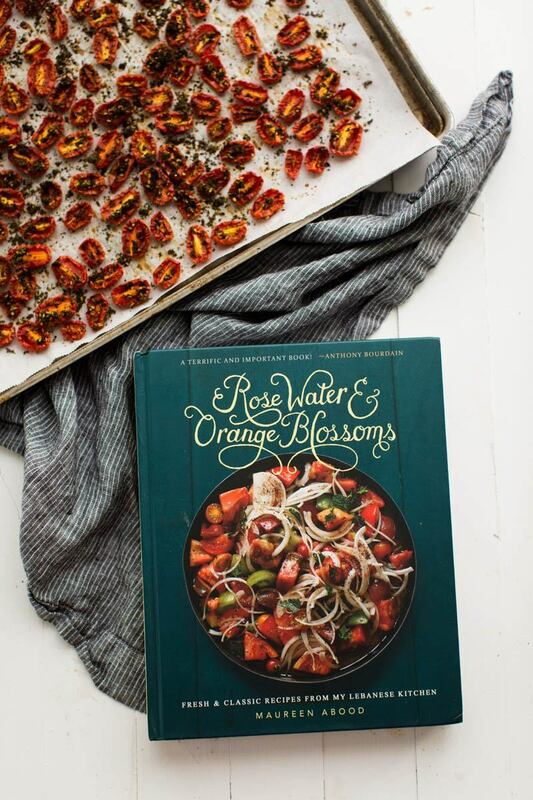 About the Book: The Rose Water & Orange Blossoms Cookbook is a fresh approach to Lebanese cooking that everyone can enjoy. It’s inspiring, especially if you are not familiar with cooking with Middle Eastern flavors. Maureen does a wonderful job at providing basics and whole recipes. While the book isn’t vegetarian, I think it’s one that can inspired in the kitchen, beyond the recipes provided. I look forward to trying many of the flavors of the book geared towards vegetables. Recipes I’m excited to try: Baked Eggs with Spinach, Labneh, and Sumac, Potato and Spinach Kibbeh with Garlicky Mint Yogurt Sauce, and the recipe for Muhammara. Get more information on Maureen’s blog, Rose Water & Orange Blossoms. Slice tomatoes in half and place in a medium bowl. Add the olive oil, salt, and pepper, tossing until the tomatoes are coated. Place tomatoes, cut side up, on a baking tray lined with parchment paper. 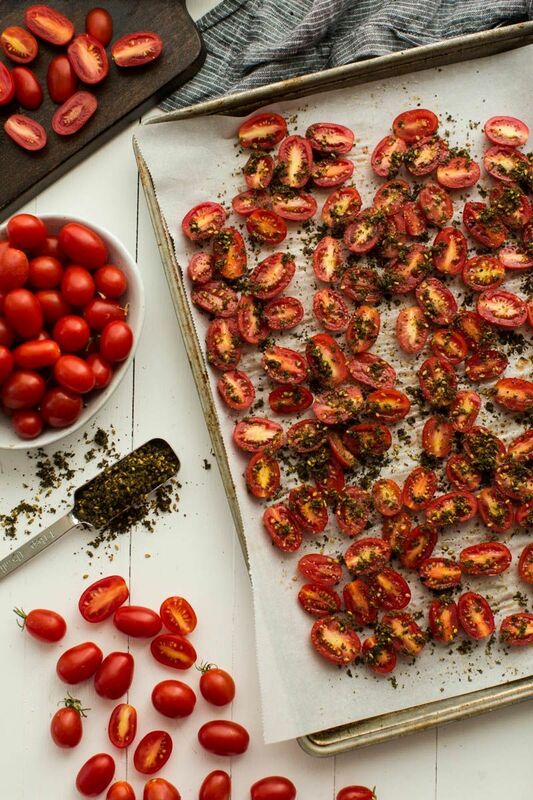 Sprinkle the tomatoes with za’atar. Turn the oven on to 275˚ and roast the tomatoes for 2 to 3 hours, depending on tomato size (Maureen makes a note that you do not have to preheat the oven.) Tomatoes are done when they are soft/tender and are just beginning to shrivel. Store with a drizzle of olive oil in an airtight container in the refrigerator for up to a week. + You can make your own Za’atar or purchase it online (I received some za’atar from Globe In’s entertaining box). Maureen’s cookbook sounds wonderful. 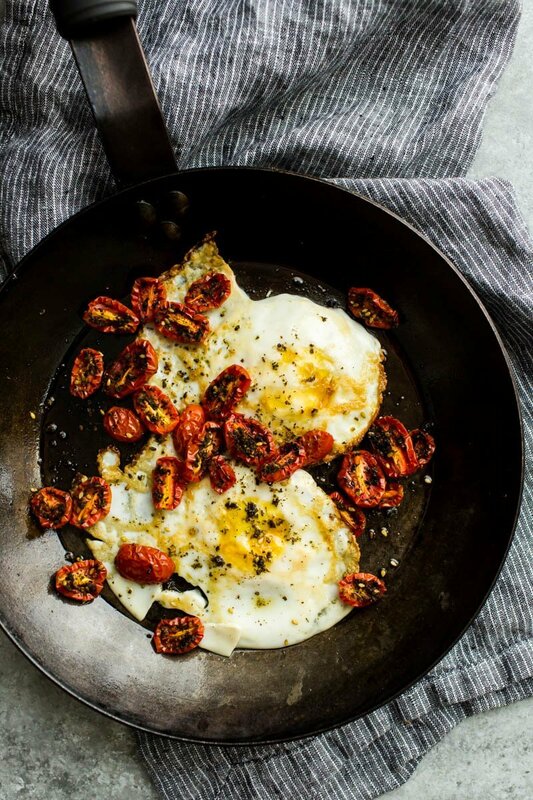 For one these roasted tomatoes – used in different ways – will surely inspire a lot of cooks and aspiring ones to keep on cooking and experimenting in the kitchen. so simple yet so delicious!!! 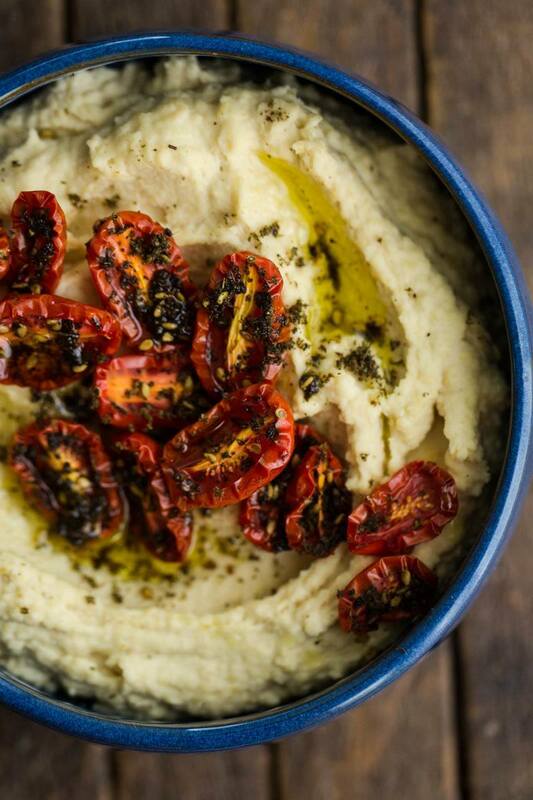 Oh yummy, I love that you tossed these babies on hummus… perfection! Fantastic. 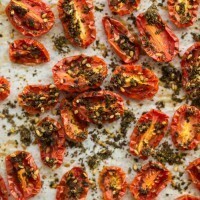 I add thyme to my roast tomatoes, but za’atar would be even better. This book looks gorgeous. Love the beautiful, bold flavors in Lebanese cuisine. These tomatoes look marvelous and I bet they made your house smell amazing. Love all the things you can do with them too! These tomatoes look so pretty and delicious! Simple but clever spice addition. These tomatoes sound so good! And you have to love how versatile they are. Tasty tomatoes on everything! These look delicious – thank you for sharing!